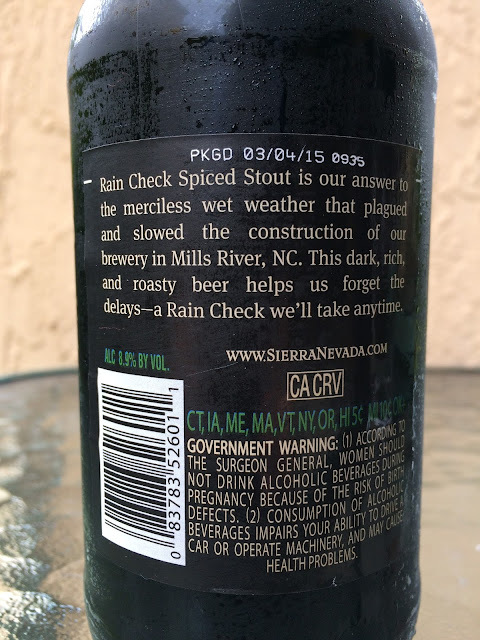 As the story on the label goes, Sierra Nevada created Rain Check Spiced Stout to help them forget about the construction delays at their Mills River, NC brewery caused by tons of rainy weather. That is the "Rain Check" they wish they had been able to take. Rain Check is brewed with ginger and lime, which is pretty interesting. The label depicts a very cool sketch of the new brewery, one I can't wait to visit! 8.9% alcohol. PKGD 03/04/15. Chocolate, roast and maybe a little spiciness in the aroma. 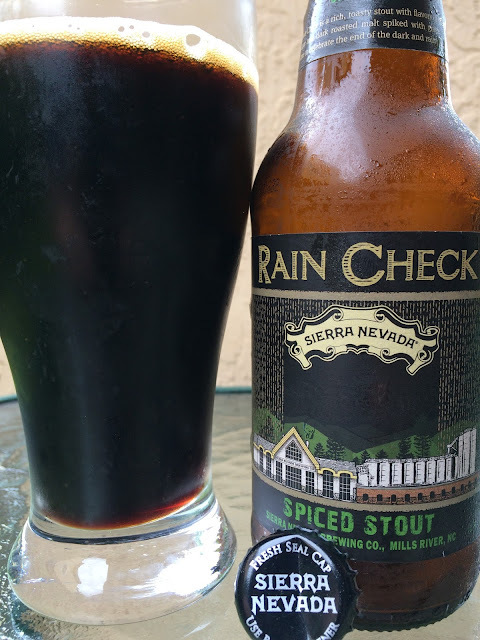 Flavors are similar but lean heavily on the roasted malt in the beginning. Chocolate, baked goods and burnt sugar (like it dropped on the bottom of the oven and no one bothered to clean it up) flavors show up next. There are definitely hints of spice and citrus, though hard to pinpoint as ginger and lime. Good body, nice lingering flavors. A hint of alcohol warmth hits you at the finish, but the alcohol is surprisingly undetectable for 8.9%. Not bad! Check it out!